I have heard rumors about the Throne of Glass series being called Game of Thrones 2.0, because of all the struggle being centered around a ‘throne’ but without a lot of extreme killing. I don’t think the two series are in anyway related except for the throne part. Sarah J. Maas just threatens to kill characters a lot, but there has only been two serious kills during 4 books and both were gruesome. 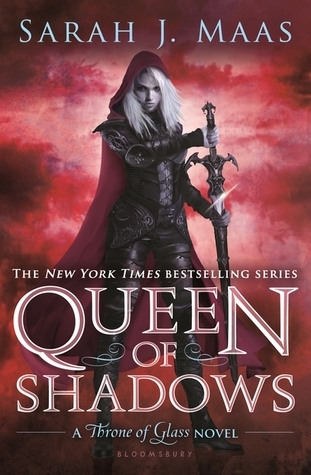 Queen of Shadows by Sarah J. Maas is the one with the least romance in it. I sort of like it because of it. For some reason even other genres can’t seem to stay away from getting the main characters a love interest. Which is for me one of the most annoying things in stories. I had problems while reading this book. The whole book long Celaena did not call herself that anymore, but her real name of Aelin. Seeing as she is the main character, you get to read her name a lot, but when that is suddenly changed, it freaked the hell out of me, but also distracted me a lot. During this book this book I liked the passages from Prince Dorian’s POV. The more time passes, the less you recognise him, because of the daemon inside him. It made me feel for him. I have to say the end to King Gavin’s reign came sooner then I expected. I thought it would happen in Empire of Storms (book 5) or maybe even later. On the other hand, I felt it was taking a very long time for Celaena to get to ending his reign. Of course she had to get into her power and get a reason for doing it. But she made the promise to Nehemia’s grave more then a book ago. It made me feel very double about the series. I do have to mention, back in Throne of Glass I got annoyed with the shallowness of Lady Kaltain (she did not have the biggest role then, but she is a side character in this book too), now she is less annoying and even has really great part to play in the story. She turns to the ‘good’ side during this book. I am very curious what becomes of her during Empire of Storms. Like I said last week, during my Heir of Fire review. I really like the character of Manon Blackbeak, although I have no idea what her part in the series is. But I still like her growth. What are your experiences with the Throne of Glass series by Sarah J. Maas? Let me know in the comments down below! This entry was posted in Book Review and tagged Adventure, Book Review, Drama, Fantasy, Romance, Sarah J. Maas. Bookmark the permalink.